If you’ve ever received a tour of Banting House National Historic Site of Canada, you’ll know that the historic house has both a ground floor, an upper floor (where Banting’s bedroom – the site of his “eureka moment” – is located), and an attic. But did you know that the museum also has a basement? In this post I offer a glimpse of what goes on in that little-known floor. The basement has several rooms in it, which are used for various things like storage, offices, and photocopying. There’s even a small bathroom in there (the house has a staggering five bathrooms!). Most importantly, however, the basement is the hub of Banting House’s activities in the area of Collections Management. My training began by heading to Banting House for a Saturday shift. I was met in the basement by Amber Frei, a volunteer at Banting House who also does Collections Management work at Fanshawe Pioneer Village. In the back of the basement we have a room designated for cataloging artifacts. With a box of newly acquired insulin vials and a notebook on my left, some cotton gloves, pencils and tags on my right, and a computer in front of me, I was ready to start accessioning. Amber led me through every step of what to do when the museum gets a new object. Collections Management isn’t very much like being in an Indiana Jones or National Treasure movie – that is to say, it’s not particularly glamorous work. But it is important work, and it’s easy to forget about Hollywood glamour when you get to handle artefacts that could be nearly 100 years old! …in other words, we list everything we possibly can about the item. This information will help us if we ever want to use the object in an exhibit, or if someone wanted to use our collection for research. It also helps us keep an inventory of what we have, and where possible gaps exist in our collections. These records are entered into the computer, which backs up a database regularly. The records are organized by unique object identification numbers. It’s great to keep our electronic files organized, but the really nice thing about the numbers is that we can use them to keep track of objects. In order to do that each object has to have its number attached somehow. As Amber told me, the most important thing to know about numbering objects is that the number has to be removable. This means that different procedures are needed for objects made with different materials. 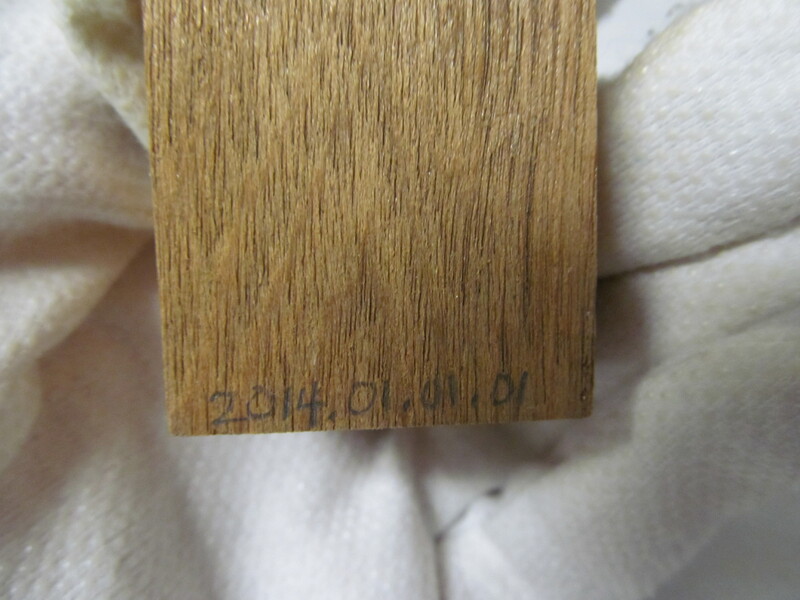 For unfinished wood, such as the boxes I was learning with, the best thing to do is write the number on with pencil. For glass, we paint on a small amount of clear acrylic, followed by the number written in black ink, covered by another layer of acrylic. (The whole thing can be removed with acetone.) For textiles, a number written on a patch of unbleached cotton can be sewn discreetly into the fabric. Big, bulky items may need tags made from archival paper and twine. Gloves are a necessity whenever objects are handled, to make sure the oil from our fingers doesn’t cause any damage. Because the collection at Banting House includes medical items, gloves are also a health and safety precaution. The training session certainly left me with a lot of information to take in. Thankfully, because I had been asked to catalogue several objects of the same type, I got a lot of solid practice and quickly found a good routine of describing, cataloguing, and numbering. Before I knew it hours had flown by and it was time to go home. I can’t wait for my next trip down into the basement. Who knows what Banting treasures are waiting to be discovered? 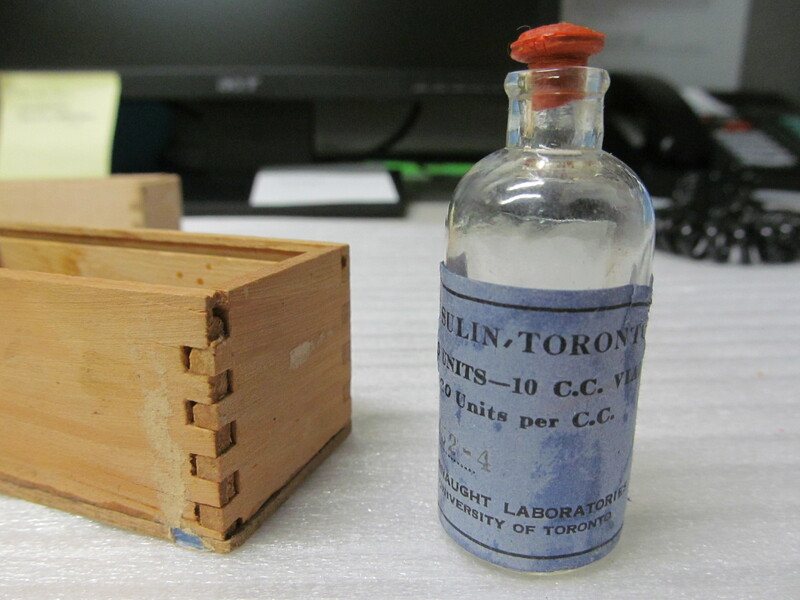 Posted in Behind the Scenes at Banting House.Tagged Artifacts, Banting, Collection, Diabetes, Dr. Banting, History, Insulin, London, medicine, Museums, volunteer.